What are air to air heat pumps, and how do they work? Heat pumps are a sustainable, efficient form of heating, particularly suitable for apartments, smaller homes, conservatories and commercial properties. Using technology similar to a refrigerator, heat pumps convert latent free energy in the air on the outside into heat which is then distributed within your property. How efficient are air to air heat pumps? Air to air heatpumps provide significant savings compared to conventional heating systems.Efficiencey levels are measured by Co-efficient of performance (C.O.P) For every 1Kw of electricity used, up to 5Kw of energy can be produced for heating or cooling requirements. Heat pumps are still efficient even at below zero outside temperatures. Its technology regulates the system which means it never uses more energy than is required at the time. Are Air to air heat pumps suitable for my property? 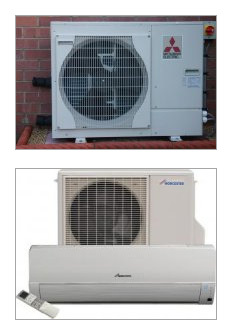 We fit a range of heat pumps to suit varying needs. It is important that your home is well insulated and draught proofed for optimum efficiency of the air to air heat pump. The outdoor unit requires very little space if floor standing and its suitability for wall mounting increases the siting options still further. An air source heat pump can also cool a property as well as heating it, which is a big advantage over conventional heating systems. Another advantage is that it acts as an purifier and dehumidifier, which is great news for allergy sufferers. Want to explore the possiblities of a heat pump in your property? Call for a chat with one of our engineers, or contact us by email or phone to arrange a free estimate.